Following an explosion at the Lysaker site in 1875, the factory was moved 40 kilometers south of Oslo to the fjord town of Sætre. The first products at Engene were Nitroglycerin and Nitrocellulose, in addition to dynamite and gunpowder. These were produced at Engene up to the early 1960’s, when much of this production was transferred to Gullaug near Drammen. The Chemring Nobel team's approach to serving customers is the result of nearly 150 years of innovation and development going back to Alfred Nobel. Ironically, an explosion over a century ago led to the creation of one of the safest and most technologically advanced energetic materials companies in the world. The Chemring Nobel story begins nearly 150 years ago with Alfred Nobel and his new process for manufacturing nitroglycerin. In 1865, Nobel helped to set up the Norwegian-based Nitroglycerin Compagniet to manufacture his new explosive in a factory at Lysaker on the outskirts of Oslo. 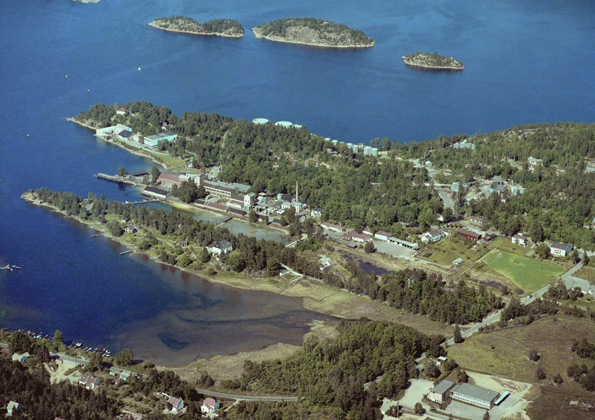 Following an explosion at the Lysaker site in 1875, the factory was moved 40 kilometers further south to the fjord town of Sætre, where Chemring Nobel still resides today, continuing Norway’s long and proud history of explosives-related production. Production of modern, advanced high-explosives at Engene started with HMX, one of the most powerful and stable high explosives produced in industry today. At the end of the 1960s, another Norwegian-based company, Nammo Raufoss (the earlier Raufoss ammunisjonsfabrikker) was commissioned to manufacture the light, portable anti-tank weapon M-72 LAW for the European market, under license from the USA. For that production they needed the explosive octol, which is a mixture of TNT and HMX. At the time, availability of HMX was very limited on strategic-military grounds, and Nitroglycerin Compagniet (later Dyno Nobel, Orica and now the Chemring Group) was asked if it was willing to start industrial production of HMX at its Engene Plant. Engineers from Engene were then allowed access to the Holston Army Ammunition Plant in the USA to study its HMX production technology. Based on this knowledge, a factory was built to manufacture high explosives. This was officially opened in 1968. Manufacture of the closely related product RDX, a more common and lower cost high explosive, started in 1972. Demand for HMX and RDX increased, and by 1984 production capacity was doubled with the introduction of two parallel production lines. The new arrangement also resulted in an extremely flexible production capability. During the 1980’s and 1990’s, manufacturing processes and production capacity were developed for the new base explosives HNS (hexanitrostilbene), alkyl-NENA (in particular Butyl-NENA) and NTO (nitrotriazolone). In 2006, Orica acquired significant parts of Dyno Nobel including the European division and thus operations at Engene. Orica then spun off production of high explosives at Engene and sold the new business to Chemring Group UK. Chemring Nobel AS was established on July 1, 2007. We are a proud supplier of explosives to the defense industry in NATO and allied countries. Our products form a vital part in a multitude of missile systems and ammunitions. Chemring Nobel is known for high quality and on time deliveries at competitive terms. Chemring Nobel is certified according to AQAP 2110, ISO 14001 and OSHAS 18001. We are regularly audited by the US Defense Contract Management Agency (DCMA), the Norwegian Defense Logistics Organisation (FLO), the Norwegian Directorate for Civil Protection (DSB) and by Teknologisk Institutt (TI). HMX is one of the most powerful and stable high explosives produced in industry today. Production began in Sætre in 1968. HMX is produced using the Bachmann method. Manufacture of RDX, a more common and lower cost high explosive, started in 1972. RDX is closely related to HMX and is also produced using the Bachmann method. HNS (hexanitrostilbene) is a thermally stable explosive used in areas including oil and gas extraction. During the 1980’s and 1990’s, manufacturing processes and production capacity were developed for this new base explosive. Butyl-NENA is an insensitive, energy-rich softener that can be used in areas such as rocket motors and explosives compounds. Production of this product also began during the 1980’s and 1990’s. Chemring Nobel has developed and patented a continuous process for the manufacture of butyl-NENA with a large production capacity and high-quality end product. NTO is a highly effective, insensitive explosive that is in demand for use in insensitive explosive compounds employed in insensitive munitions. Chemring Nobel has a significant NTO production capacity and, thanks to its unrivalled experience and expertise, is the global leader in production and use of NTO.